Homemade No Churn Peach Ice Cream.... AMAZING! 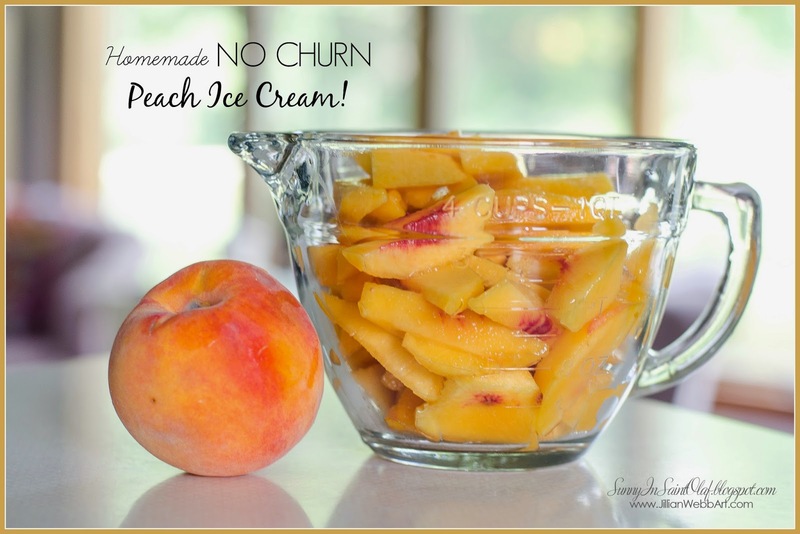 Here is the no churn peach ice cream recipe I mentioned earlier this week! It was absolutely delicious and will definitely be my "go-to" summer dessert recipe! Last night a couple of our neighbors came over to play cards and have some peach ice cream. (Homemade Peach Ice Cream recipe- super easy/No churn!) As the night was winding down and our friends were about to leave, there was a ruckus in the direction of our garden. 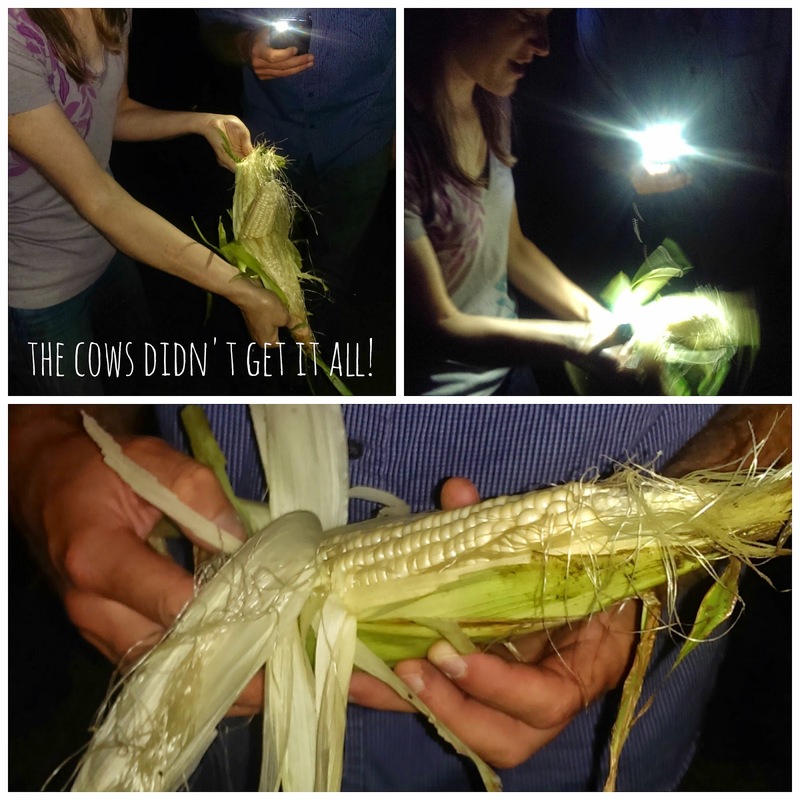 To our surprise, there were several large cows munching down on our tiny sweet corn patch! Eeeek! 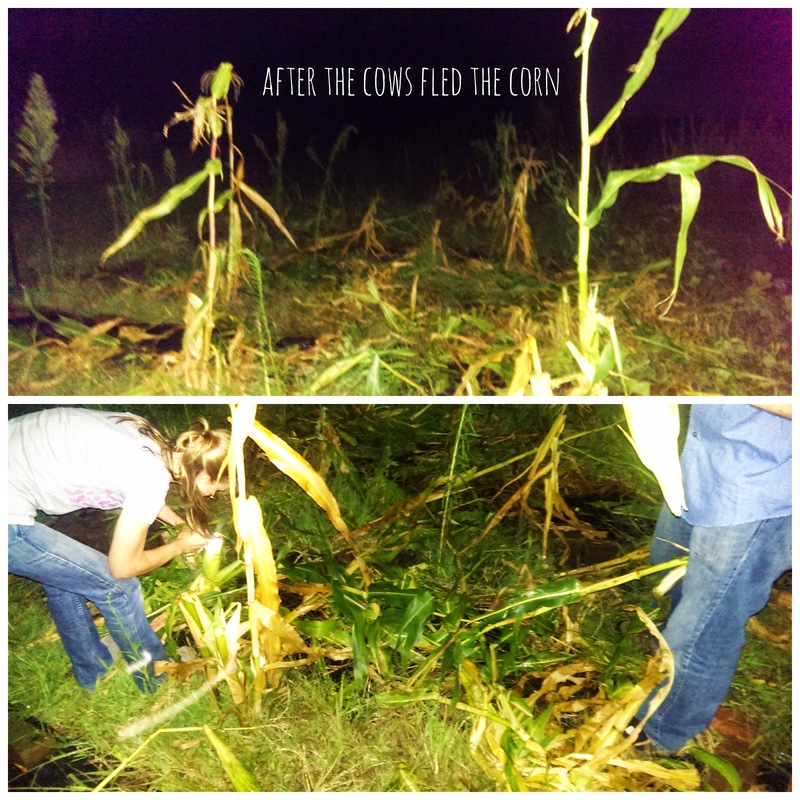 Luckily Kate, my gardening budding, was here to help me salvage what we could of our corn! 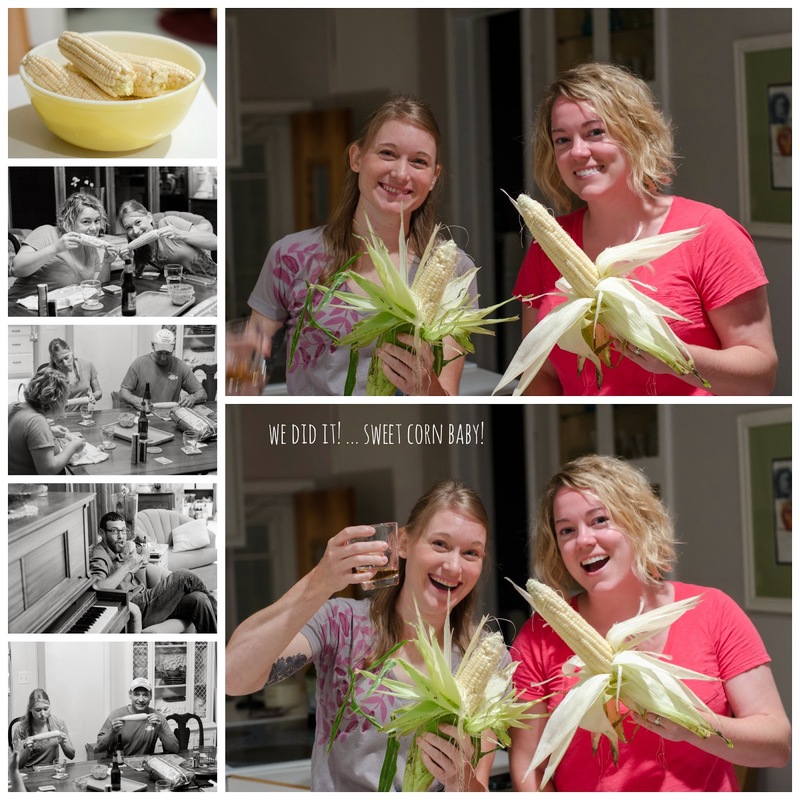 We decided to cook our corn right then and there! Nothing like a sweet corn party at 10pm! Only in Iowa?! What a way to enjoy our first sweet corn from our very first garden! I promise I haven't given up on my 100under100 series! Our Updated Farmhouse Kitchen :) Loving it! This summer, Momma Herrmann spent several weeks with us at the farm. Somehow, big projects always seem to get tackled when Mom's in town! During this visit, she helped us clean up our flower beds (also known as "weed beds") and she got us in gear and helped us update our kitchen! I found this fun accent color in Elkader at Carpet and Design. The brand is Diamond Vogel and the color is "Origin," a shade of green with a bit of a citrus feel. We used it in our master bedroom with plenty left over, so I decided to use this color and make my own chalk paint for accents in the kitchen. 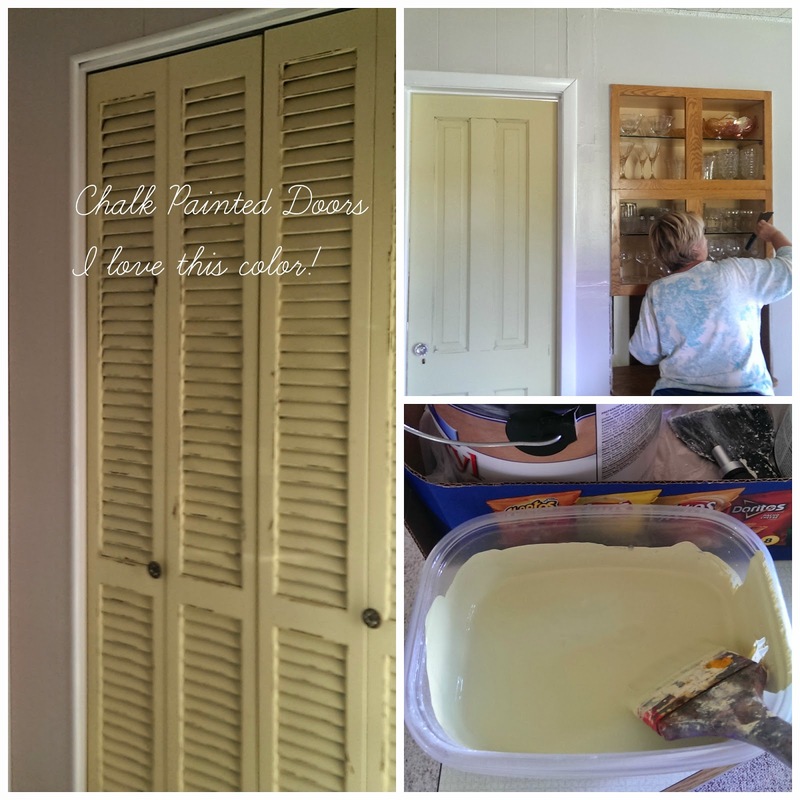 To see more about chalk paint, check out my first chalk paint project! For this chalk paint, I used a plaster of Paris recipe. I thought it turned out really well and only needed two coats for good coverage. 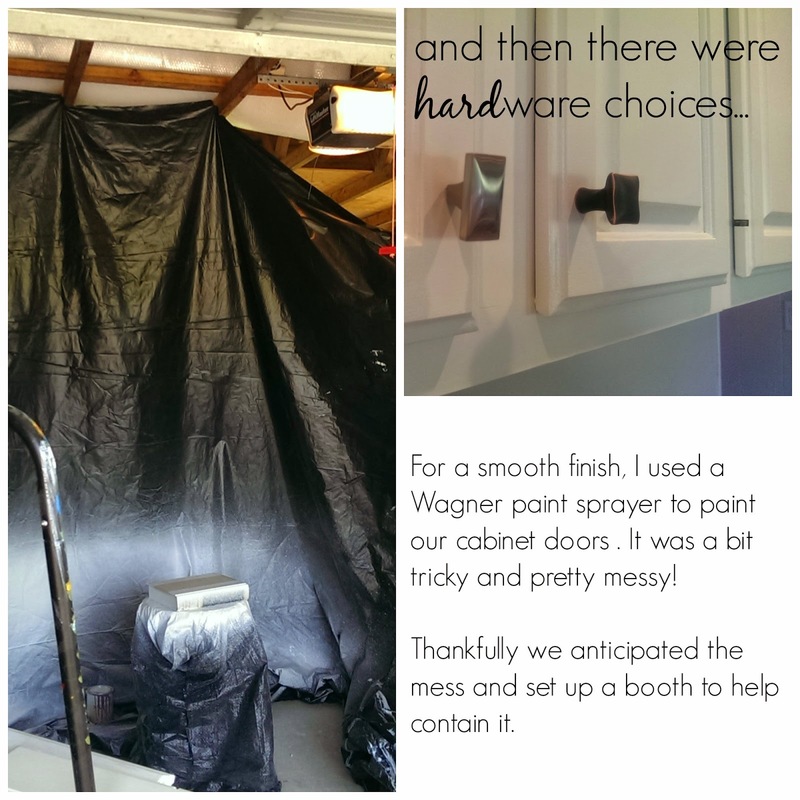 Spraying our cabinet doors was pretty messy! 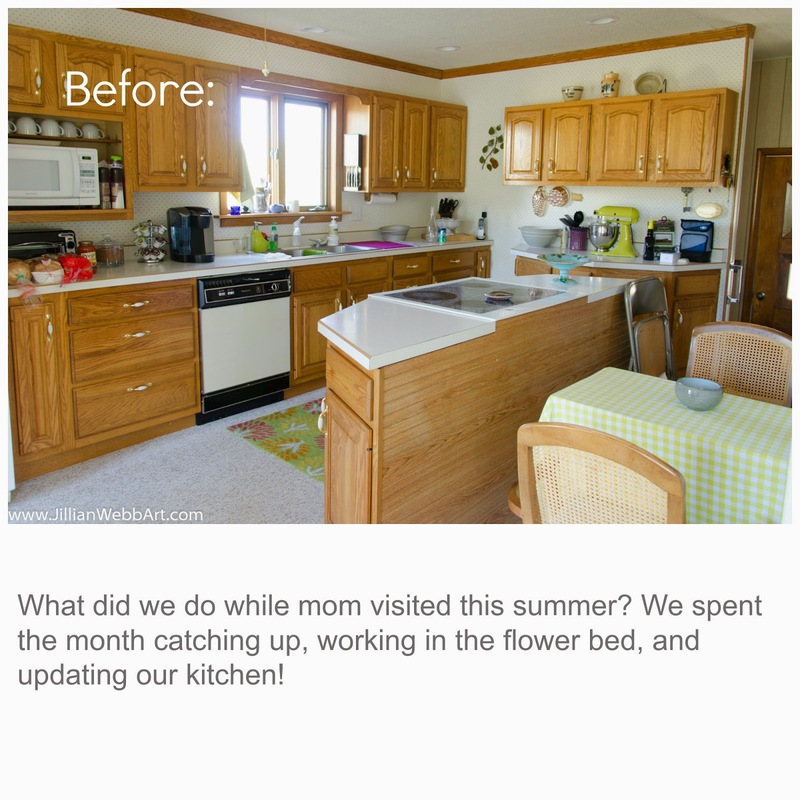 It was a messy, sweaty month, but seeing our kitchen come together was very rewarding! I love all of the little details. Coming home to our bright and airy farmhouse kitchen makes me happy. There will always be things to do, updates that need to be made, eventually a new floor, entry-basement update, and maybe larger scale renovations... but for now, I'm loving our freshly painted kitchen, our trusty old appliances, our new faucet and hardware, and our freshly picked wildflowers. A humongous thanks to Momma Herrmann for all of her hard work and motivation! She put up with me when I was tired, sweaty, and maybe even a little bit grumpy. She worked so hard to help us finish up before she and I flew back to NC; she didn't want me to come home to a mess. 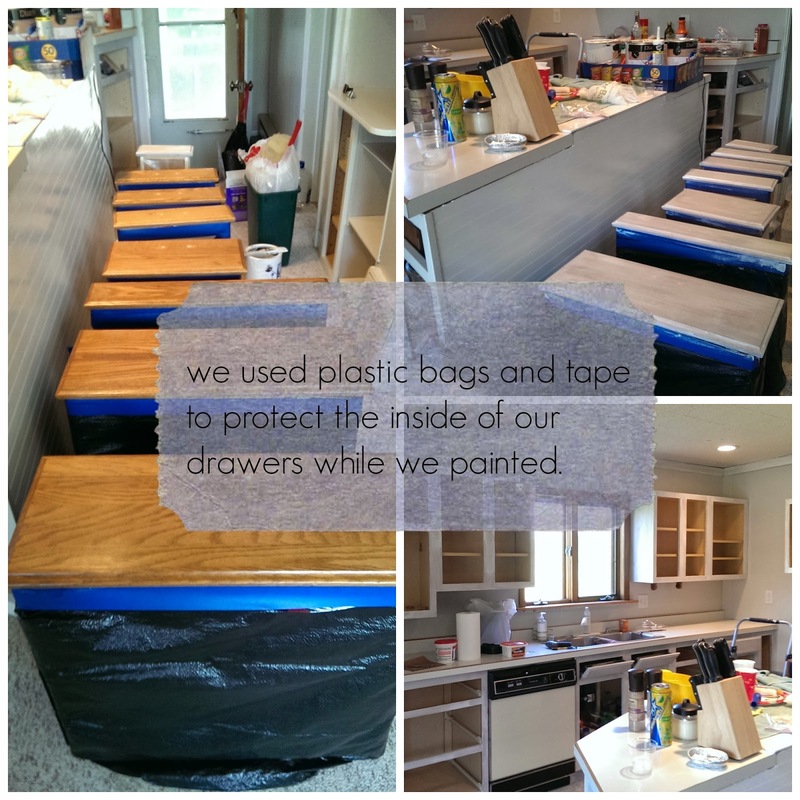 I couldn't believe how much was involved in our "little painting" project, or how long it took to put everything back together, but I'm so happy we did it! I LOVE coming home to our updated kitchen! This update was done on a dime! Primer/paint/sandpaper and elbow grease! The only things we actually replaced were our cabinet hardware and kitchen sink faucet. with our clean white cabinets, fresh gray walls, and pops of green! Looking for the perfect one of a kind gift? Can't decide between all of the beautiful options? 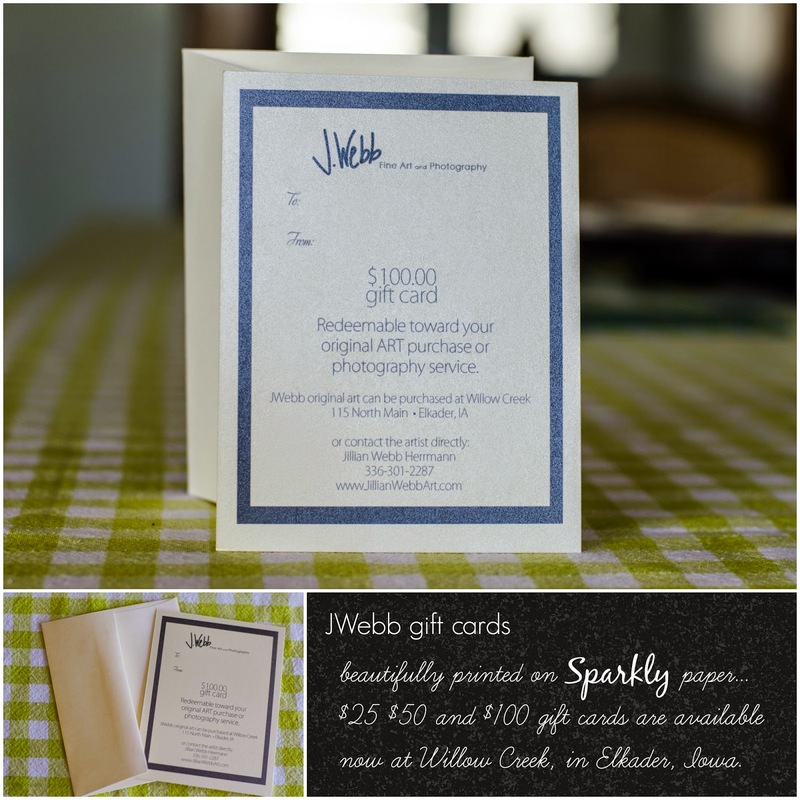 Surprise your loved one with a J Webb Fine Art and Photography gift card! 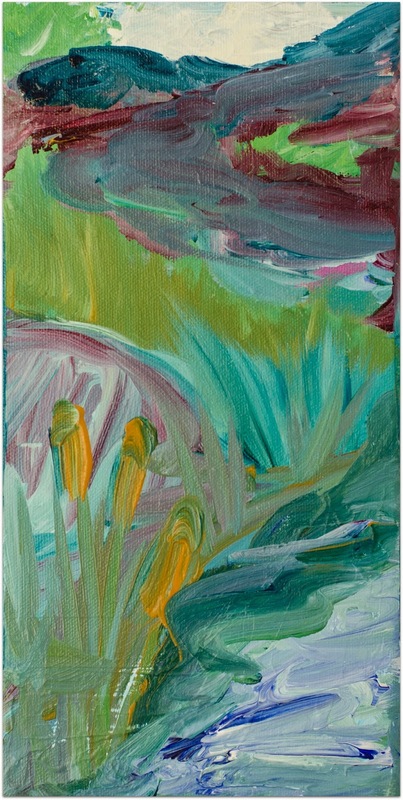 Redeem for J Webb original art or photo service­! $25 $50 and $100 gift cards with envelopes are available now at Willow Creek. 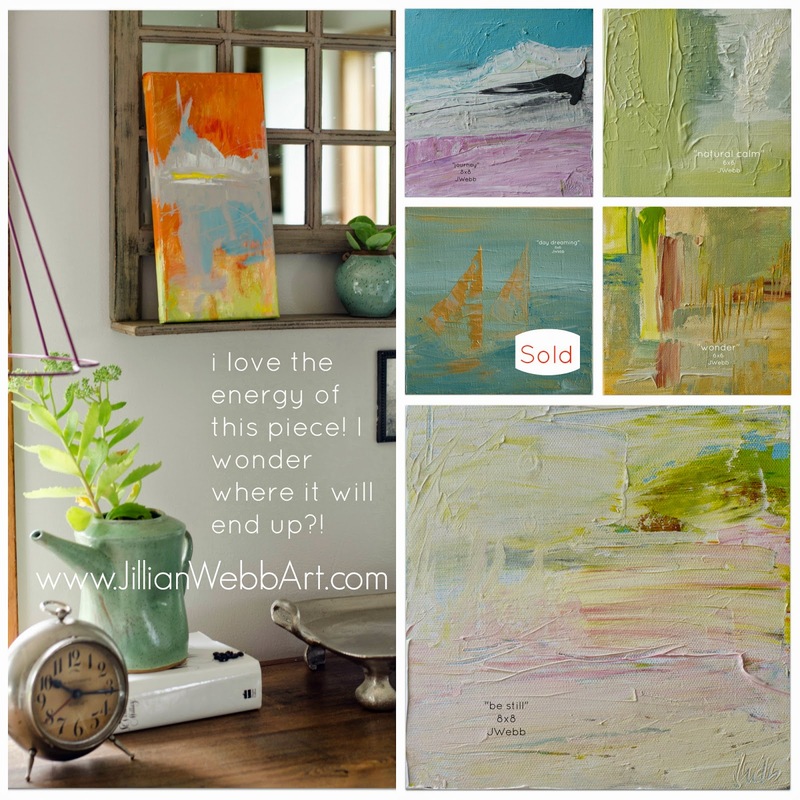 Contact Jillian@JillianWebbArt.com for questions or inquiries! While we're on the subject of art... here is an Iowa landscape painting I did before we moved out to the farm. Zach's Grandma, Ethelyn Herrmann Berns, is a wonderful artist. When she decided to downsize a few years ago she gave me several of her art books and reference photos. I was drawn to the rolling fields and breathtaking landscapes of Northeast Iowa from my first visit and couldn't wait to paint from Grandma's reference photos. Now that we moved to NE Iowa, I can't believe I get to see these rolling fields everyday! I finally got around to having this piece framed and it is currently for show and for sale at Willow Creek! An Art-filled Delicious Evening at Willow Creek with the Elkader Chamber of Commerce! What an excellent evening with the Elkader Chamber of Commerce! I truly enjoyed sharing in the excitement of Willow Creek's new location and meeting so many new faces. Our refreshments were scrumptious, and you can buy your own at Willow Creek! Stop in on Saturdays for a sample or just take my word for it! Of course, Janet provided some amazing Iowa wine and even homemade sangria! In summary, a completely wonderful evening! 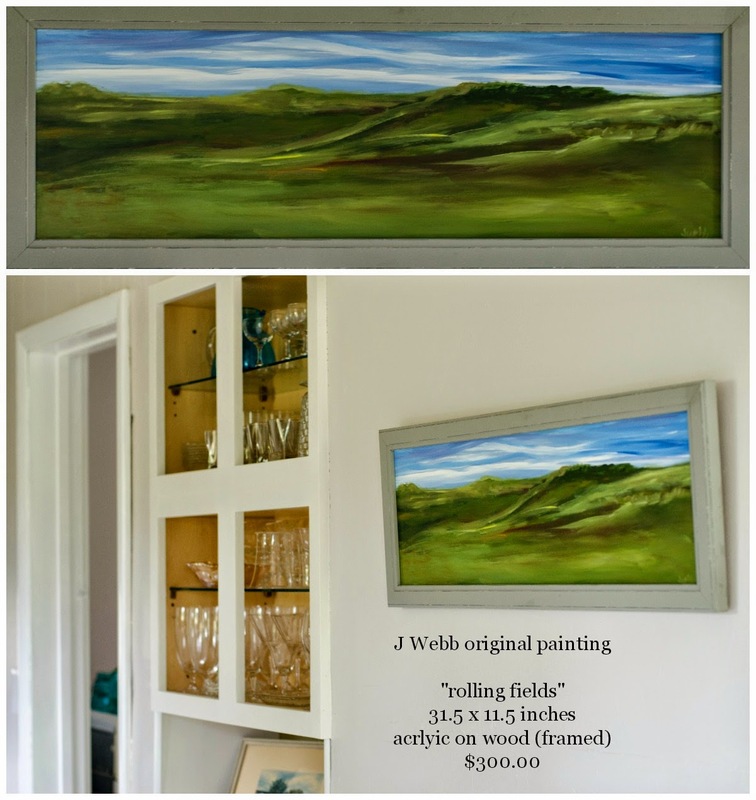 Thank you to Janet for believing in me and exhibiting my artwork at Willow Creek. Also, thanks to the Chamber members for taking the time to come out this evening! We look forward to seeing you folks around town.